It all started from materials: metal was my preference. I was born in 1946 in Burgundy, in Montbard, the land of Buffon forges, very near the power hammers of the factory where my father worked. How could I not be attracted to fire and metalwork! I chose to convert metal from scratch, shaping it, distorting it, modelling it… I thus prefer to use rough metal rather than already formed metal parts, scrapped parts for example. 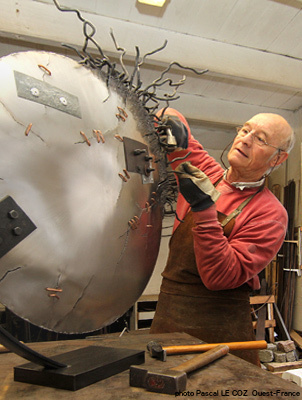 I became a Breton sculptor and in 2006 I opened my workshop in PORDIC, near Saint-Brieuc, in the Côtes d'Armor department. In my workshop I run some vocational placements with one or two trainees who wish to discover metal sculpture and to individual upgrading courses involving shaping and welding operations. My sculptures surely express these issues not only at the individual level, but also at the level of our societies, which are trying to find the right balance between the links required for their cohesion and the breaks that are also indispensable for their progress and the expression of their freedom. my work is articulated around these two inseparable concepts that bring us back to our human condition and to the actual essence of any life. Physical and symbolic links, essential for its emergence and meant to be stretched out or even broken to reach its own existence.